I smell some make-up plans brewing! As promised, I have my first transformation to share with you this year. This is one of my all time favorite projects. 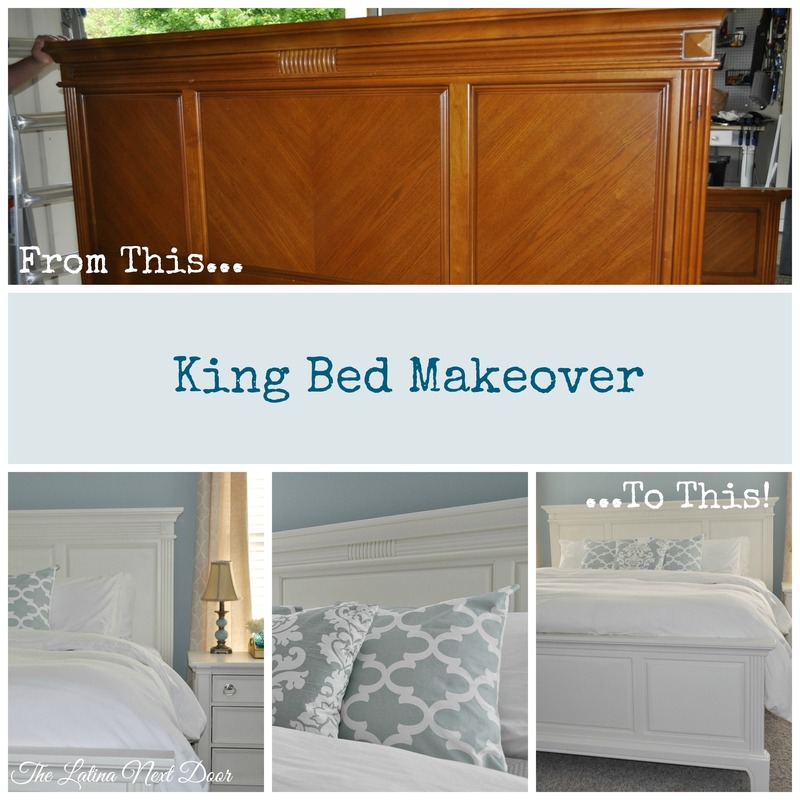 Our king bed transformation…. It was time we upgraded from our Queen and into a King size bed. Before kids, the queen was fine but now that our little ones sneakily get in between us to cuddle in the middle of the night my husband and I realized the Queen just wasn’t cutting it. She had to go…. Since obviously, I could not bear to get rid of such a nice and expensive piece of furniture, duh! At this point though, our budget was not nearly as flexible as it was back when we got our Queen, so naturally, I had to get in touch with my good friend Craig… as in Craigslist. It took a couple of weeks, but patience paid off and I scored, BIG TIME. I found a bed similar in style to what I already had and the people selling it were less than 15 minutes away. 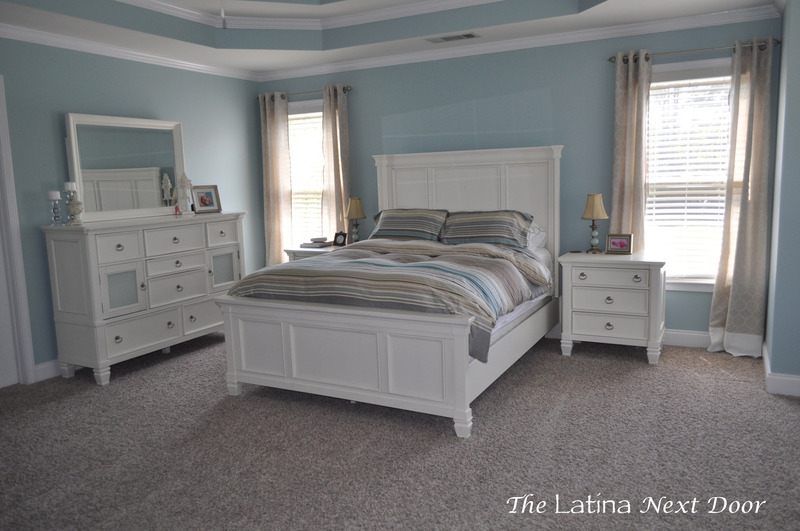 Not only that, but we got the bed for $150.00 – solid wood. I was in heaven! Let’s check out the transformation and how we did it! This is what the King looked like when we picked him up. 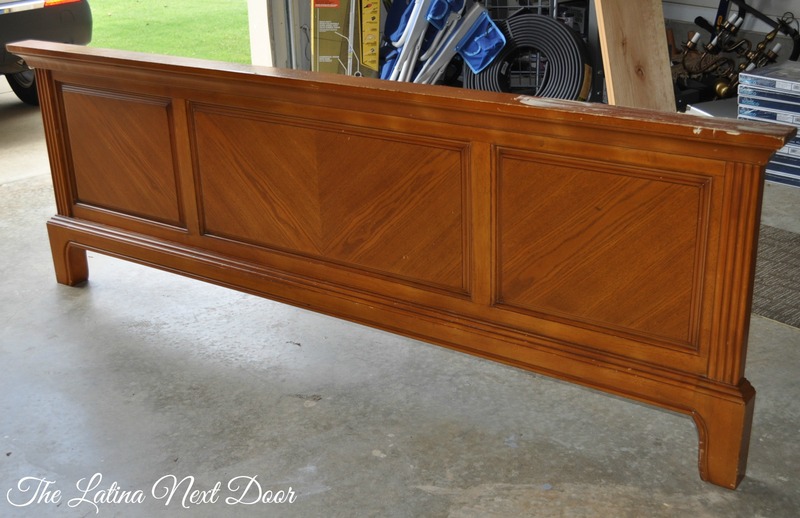 This piece was solid (as in pretty heavy) and while it had really pretty wood grain, it was so dinged up from years of use (not to mention it didn’t match the rest of the master bedroom decor) we had to touch it up and paint it. As you can see there was damage that was too noticeable. This was on the top of the footboard. We used Elmer’s wood filler and our Purdy little spatula. And boy, we used up a ton of wood filler on the side rails! 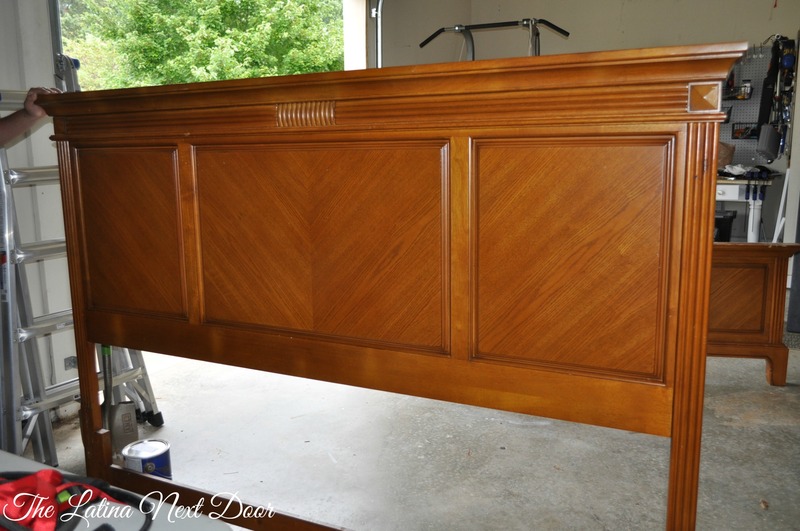 Then once the filler was dry and had hardened we sanded….. and sanded….. and sanded…..
We used Zinsser’s oil based primer (2 coats) since I had some left over from another project. Using an oil based primer really seals the furniture and prevents the knots and/or any stains on the furniture to penetrate through the paint. It’s just my preference. 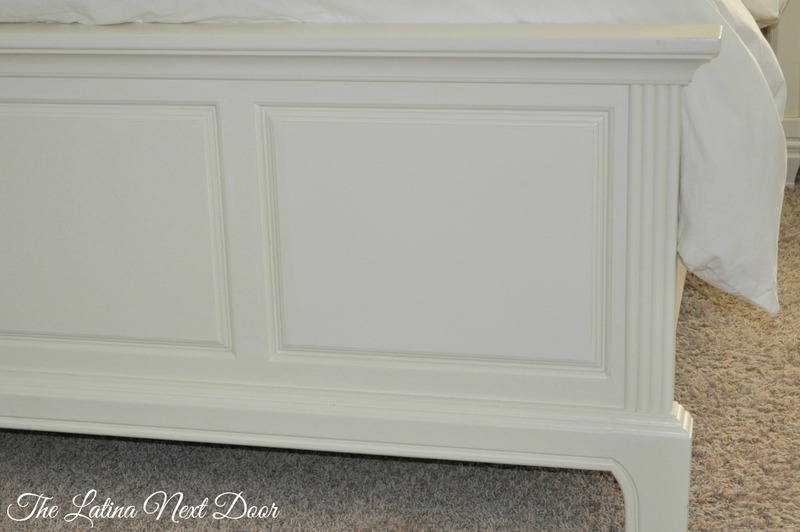 In order to get the paint to match the existing furniture, I took a shelf from the armoire in our bedroom to our local Sherwin Williams and had it matched. Perfection! I purchased a satin finish. We gave it 2 coats (3 in some areas), then sprayed it with Polycrylic clear coat and let it dry for over 2 days to fully cure. And at last we took that baby upstairs! As you can see installation was pretty basic. Then after adding a ton of heavenly fluffiness (in the form of a down comforter from Ikea) we were all set to enjoy our additional space in bed. That is until the kids sneak in…. I would say it is a very close match to what we had in there before (see below), only far less expensive. 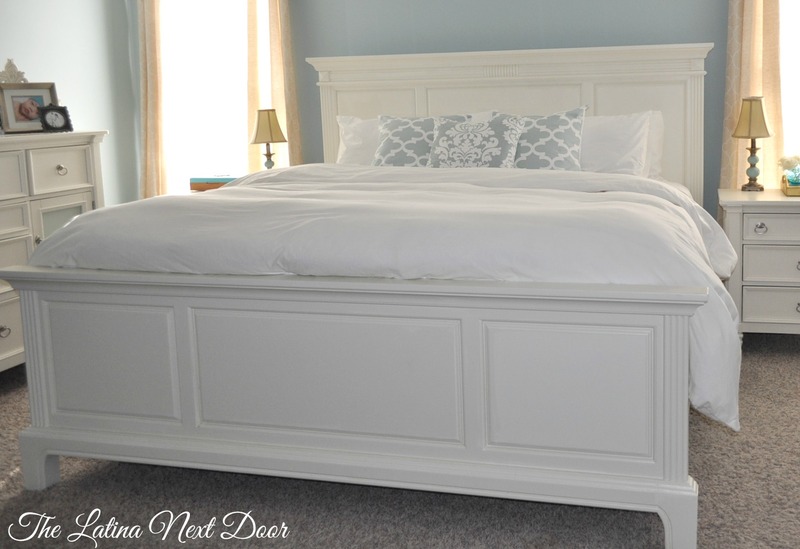 Our new king bed cost us under $ 200.00 – this is counting the price of the bed, paint and materials. We saved us some big bucks on this one. 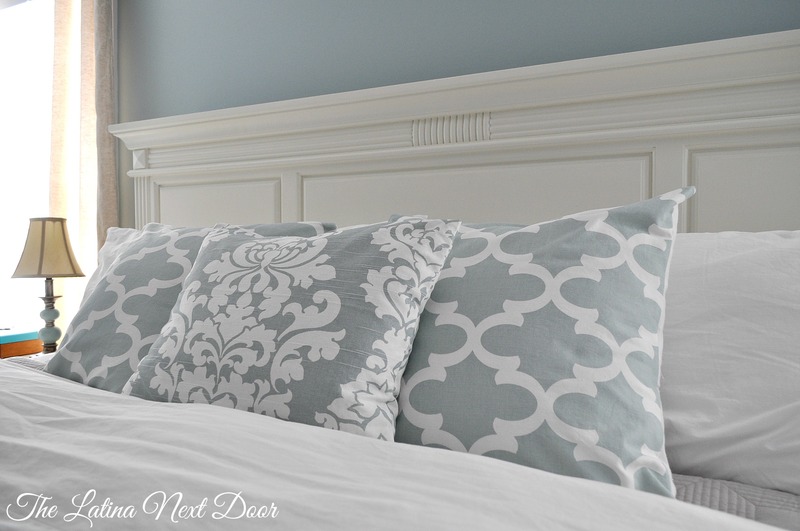 …and the headboard next to the night stand. You can still see all of the details in the headboard too. I was afraid it might get lost with the one color, but it still shows very well. Psst… I made those pillow covers too! Tutorial coming soon…. Well, I hope this inspires you to get on Craigslist next time you look for a piece of furniture. I love bringing stuff back to life. It can take a little time to complete and LOTS of patience, but in the end the satisfaction of having saved money while creating something so unique makes it all worth it to little ole me! 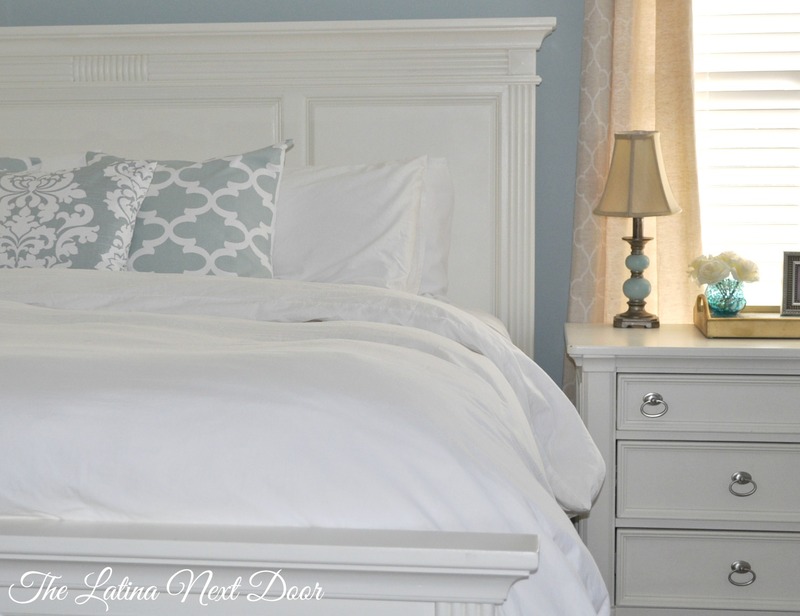 As always, please let me know what you think of our king bed transformation as I would love to hear your thoughts. Now if I could just replace those itty bitty table lamps for some that are more substantial…..
Pssst… you can check out other awesome DIY projects like this over at the #DIYLikeABoss and Brag Worthy Thursday link parties….